Purchase this product now and earn 2,240 Reward Points! 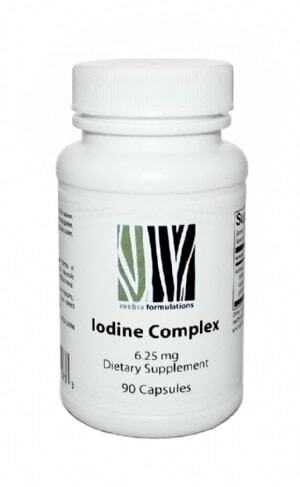 Essential for formation of thyroid hormones, iodine’s benefits for immune function are less well known and understood. Higher intakes, similar to the higher amounts consumed in Japanese diet may be required to achieve whole body sufficiency. 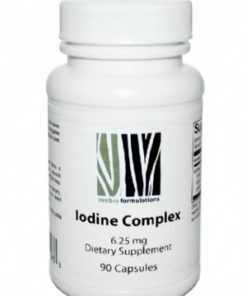 Growing evidence suggests that RDI levels of iodine of 150 mcg daily, while beneficial for thyroid function, may be far too low to support the needs of other organs throughout the body. Instead, milligram amounts, as well as different forms of iodine, may be required to maintain normal cell integrity and optimum function of the mammary glands, gastric mucosa, thymus, and numerous other tissues that also concentrate iodine. To help achieve iodine sufficiency, zeebra formulation’sIodine Complex is formulated with inorganic iodine in three beneficial forms, molecular iodine, potassium iodide, and sodium iodide. Our vegetarian capsule formulation avoids the gastric irritation and unpleasant taste as may occur with liquid forms of iodine. Other Ingredients: Vegetarian capsule (hydroxypropyl methylcellulose, water), cellulose, silicon dioxide, and L-leucine..